The injured party. Note the lack of symmetry to the right button. Waiting for the vet on Friday. I’m not worried. Mathilda is getting steadily if slowly better. This appointment is more in the way of a systems check to insure we are on the right track. No big deal. I am working at my computer. Cat on the desk. Dog at my feet. The gentle hum of the server is the only sound. 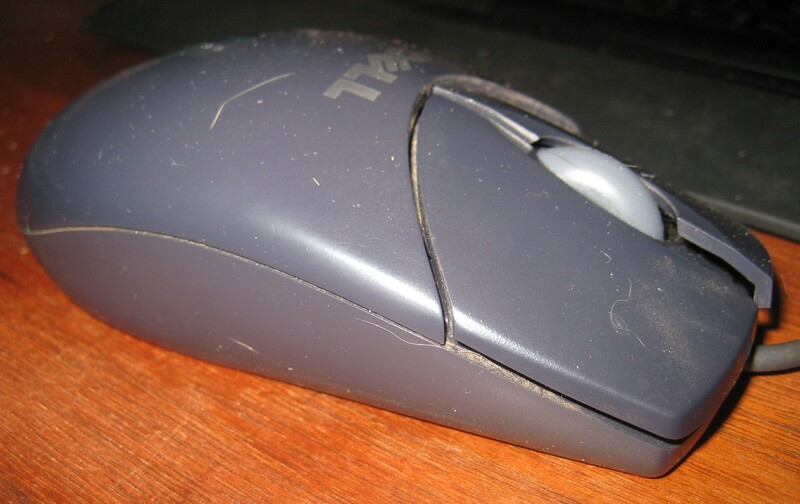 Then, my mouse – once again – declines to move the cursor to the left. I smack it remedially against the desk. Cat is taken aback. She – once again – knocks a pile of paper off my desk. I become verbally perturbed. Cat and dog leave the house at Mach II. The 80-pound Shepherd leading the 8-pound cat by a nose. Okay, so maybe I was a little worried. I knew a woman who threw silverware into the sink for maximum noise with minimum damage. How do you express yourself?